Courtesy of Copyblogger, this infographic demonstrates how to repurpose existing content in a different media format, get more bang from your archives, and reach new and different audiences in the process. The graphic is based on 21 Ways to Create Compelling Content When You Don’t Have a Clue by Copyblogger guest writer Danny Iny. Copyblogger re-imagined the way to present these content-creation tips, while adding a meta-fabulous #22 (you’ll see why). Enjoy! Courtesy of April Neill Public Relations, a boutique PR firm serving small businesses and non-profits in Chicagoland. April Neill PR offers FREE 30 minute phone and in-person consultations. For more information, visit AprilNeillPR.com, call 815.651.0656 or email info@AprilNeillPR.com. With the rise of content marketing, being able to write effectively is hugely important. 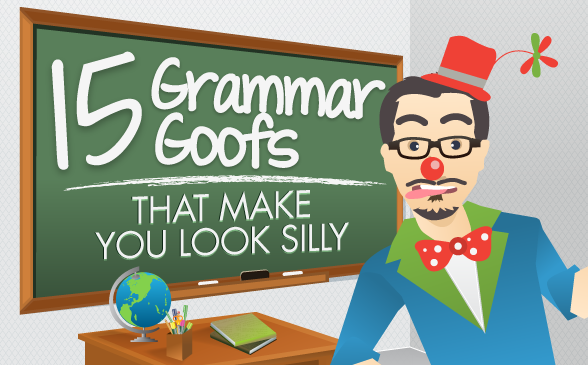 Avoid some common grammar errors with this really cool info-graphic. Enjoy!